Earlier this week, the MTA estimated that it will lose $215 million in revenue from subway and bus fare evasion. 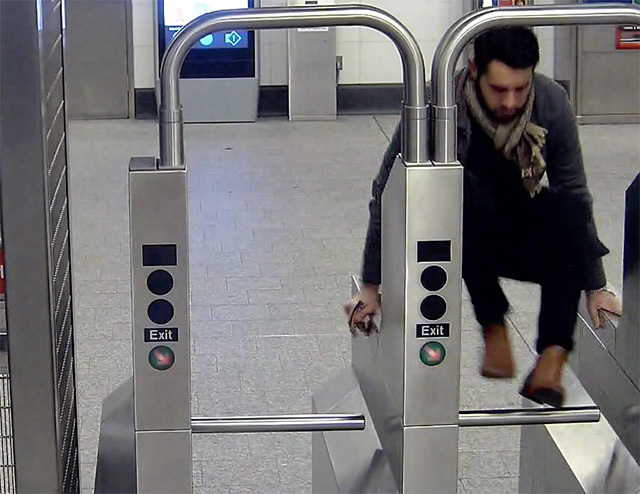 To further drive home the point, the agency put together a montage of subway farebeaters from late November. As WNYC's Stephen Nessen has reported, the agency has been blaming fare evasion for part for its financial problems—it will be staring down a $1.6 billion deficit three years from now as commuters contend with increasingly frustrating service declines—and claiming that the rise in fare evasion is due to the Manhattan District Attorney's 2017 decision to end most criminal prosecutions for theft of services. According to the MTA, since 2015, the amount of uncollected fares has gone up by $110 million. There were about 210,000 fare beaters on buses, and 109,000 on subways in 2013, compared with 348,000 farebeaters on buses and 208,000 on subways so far in 2018. At a special MTA board meeting on Monday that focused on fare evasion, Byford said even agency executives may be deployed to stop fare evaders. "We will get teams of people from the head office to, on a random basis, go and either ride buses or stand at gate arrays and provide a physical block to make sure that you have a ticket before you go into that station or onto that bus," he said. "We will, of course, have [additional MTA] teams or police to back us up." While the video shows a diverse cross-section of New Yorkers refusing to pay their $2.75 subway fare, either by jumping a turnstile, walking through an open emergency door, or slipping, however awkwardly, under a turnstile, 89% of the subway arrests between January and August were black or Hispanic individuals. The NYPD's Chief of Transit told reporters on Tuesday that stops for turnstile jumping have gone up by 25%, because the new policy has actually freed up police officers to stop more offenders. Asked why he is focusing on fare evasion given the history of racial disparities in enforcement, and the relatively meager payoff ($215 million is a fraction of the MTA's $16.6 billion operating budget), Byford told reporters on Wednesday, "I’ve got to be fair." "On the one hand, absolutely, let me make this crystal clear, we cannot in any way, have a system that is biased against any particular ethnic group. That, we must be very, very careful to avoid. But equally we’ve got to be fair to those New Yorkers who pay their fare and who rightly expect the Transit Authority to collect the monies owing to it, so it's running in an efficient manner. We must get that balance right."